Everyone can get into the holiday spirit this year, even if you’re typically only as cuddly as a cactus or as charming as an eel. Capture the original Christmas curmudgeon, Dr. Suess’ Mr. Grinch, with these mean, green, holiday crafts. Try a lime-hued baked good, or a simple construction paper Grinch-themed decoration; we've rounded up a variety of projects for kid crafters of all ages and levels. No matter what the craft, a Mr. Grinch homage will bring a little humor to your Christmas celebration. 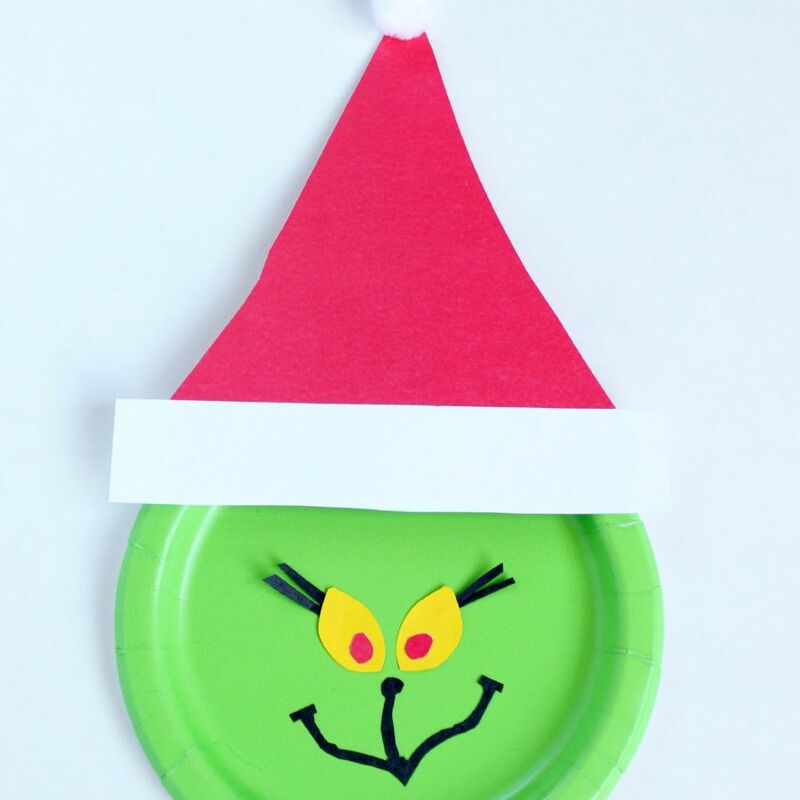 A lime-colored paper plate is the perfect base for a smiling (or sneering) Grinch face. Glowing yellow construction paper eyes and a pasted-on Santa hat finish this cute, DIY-ed decoration. Make a whole set and scribble in guests’ names as clever place markers for your family’s holiday dinner. Channel that Grinchy green via this tactile craft. Mix up a big batch of dough (mostly flour and water), then add a couple of drops of neon green food coloring at a time, until you’ve reached the perfect, ghastly hue. Little ones will have a blast sculpting their own, personalized Grinch statue at your holiday party. Pro Tip: Leave the kids' sculptures out to dry and decorate, then save them for Christmases to come. Hollow plastic bulbs are essentially a blank slate—they can be filled with everything from crinkled paper to colorful candies, and will readily accept paint and glitter too. These specific ornaments use a paper cutting machine for Grinch’s features, but his eyes and smile could just as easily be puffy-painted on freehand. Spoil your holiday guests with a sweet surprise hidden in their dessert. Mix up two pound cakes—one in neon green and the other in red—then employ your heart-shaped cookie cutter to form a bright crimson heart, running the length of a loaf pan. Fill the pan with the neon green cake batter directly over top, then bake until done. Top with frosting and sprinkles to fully disguise Grinch’s growing heart. Why not give Christmas party goers something to do while the roast beast (er, beef) cooks? Print out a 2-foot Grinch, thanks to this handy template, then color or paint him perfectly green. Cut enough hearts for your guests to pin, then let the games begin. Mean old Mr. Grinch had a tough time shimmying down the chimneys of Whoville, and you can capture his faux pas with this cute wreath. An adult should loop green tulle through a round or square wreath form, but kids can definitely help decorate it. Teeny ornaments, presents, and bows look great before popping in a pair of felt Grinch legs. Take this one the extra mile by threading a set of LED twinkle lights through. Even the littlest of Santa’s Helpers can join in on the fun creating these sweet treats. Dip marshmallows in lime green chocolate, then decorate with a marshmallow Santa hat and a piping bag full of colored icing for Grinch’s eyes and mouth. For a more decadent dessert, try subbing cake pops for the marshmallows. While this craft does take a little more skill than a few of the others included here, it’s worth the extra effort and adult supervision. Cover a crude wire hand in green fuzzy fabric, then pinch into the perfect Grinchly grasp (a wire hanger can be repurposed for your base). Add a Santa cuff and shiny ornament, then hot glue the entire thing into a gilded frame. Recycle an empty jam jar into a clever storage container for your holiday ornament hooks, spare twinkle lights, or bits of festive ribbon. 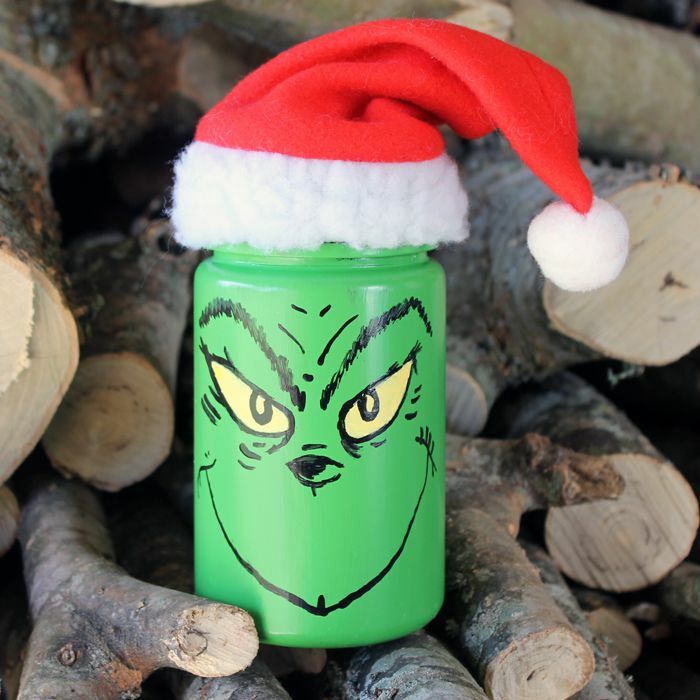 Paint a clean jar green, then add Mr. Grinch's features using precise paint pens. Or, consider this a gift-able container for that hand-dipped candle or homemade cookies. This is a great option for a DIY-ed teacher gift that kids can directly help personalize. For that special Mr. Grinch in your own family, stitch a custom furry green stocking to string along with all the Who stockings hung with care. This craft is definitely a good project for beginning sewers: a robust faux-fur fabric will hide any uneven hand stitches well, so encourage budding seamstresses to tackle this as a first piece.